Requirements for teams (Dog and Handler) who want to enroll in Beginner Agility class. Dogs MUST be friendly to people and other dogs, if you are not sure of this, you must schedule and pay for an evaluation before signing up for Beginner class. Dogs will be asked to leave class if they are aggressive or extremely reactive. Dogs need to be “fit’ and is good physical shape as they will be performing athletic skills, so they must have good fitness. 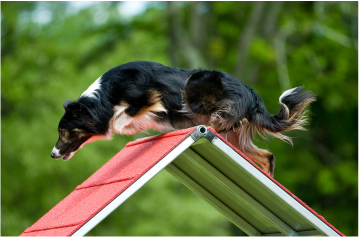 The Kim Seiter Dog Agility training program teaches you how to effectively communicate with your dog using positive reinforcements. This training program is the most through foundation training program for agility. It will teach you how to put your dog’s behaviors on cue while your dog learns how to use their body effectively for training the sport. In the beginner class each dog is evaluated, and training is geared to focus on your dog’s individual needs. The beginner agility program consists of a series of classes that a student MUST complete before taking any higher-level elective class. *The difference between puppy and adult classes are that some skills and obstacle training is modified to accommodate young dogs who are still growing. Puppies are grouped 8 weeks-20 weeks, and 5 months to a year old. The class progression is listed below. Beginner Agility introduces the trainer and dog to clicker training. This is an established training concept where you mark the behaviors your dog produces with a “click” and food reward. This class teaches you how to train your dog to perform a variety of tricks. These tricks help your dog learn how to use their body in preparation for more advanced training in the sport. Training will include; impulse control hand touch, nose touch, foot targeting, right and left turns, sit, down, stand, go in a crate, crawl forward and backward, sit up and beg, get in a box, balance boxes, balance disk, balance peanut, tunnels, front cross, rear cross, blind cross, and single jump collection. Advanced Beginner class takes the skills of Beginner Agility and advances them. All Beginner skills will be reviewed and taught perfected in combination. This class focus is on building the dogs confidence while learning to fluidly offer behaviors on cue. Training includes; Sit, down and stand on verbal and hand cues, crawl forward and backward 5 feet, roll over, body awareness positions on balance equipment, right and left turns around a cone, weave pole entries, introduction to plank, stopped contact position, hand stand, A-frame, see-saw, dog-walk. This class may be repeated. The Intermediate class continues to train all the skills in Beginner and Advanced Beginner, while combining more complex behaviors for the dog to perform. This class may be repeated until dogs are ready to proceed to the more specific aspects of the sport which are divided into five categories. These classes give you a much more detailed focus on each skill required for the sport of agiity. Sequencing consists of teaching the dog to read obstacle lines. This training will use jumps and tunnels only and teaching straight running and turning lines. Handlers learn how to use motion to drive the dog through the obstacles lines and the dog learns how to run at speed with the handers motion. Contact training will include learning the challenge of each obstacle and performing it to the skill and safety required in competition. 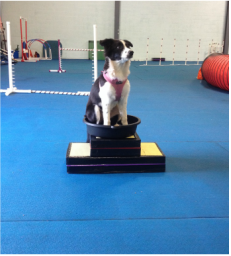 All equipment will be at a low height and progressed to competition height once dogs are able to perform the following skills; the obstacle off the right and left side, recall and send positions. Students are taught a stopped contact position, with some running A-frames if it suits the team. This class will let the instructor and you decide what contact training is best for you and your dog. This class will take the foundation behavior of weave pole entry positions and systematically advance the skills until fluent weaving is performed. Each team has its own time line on how long this training will take. Variables include, access to weave poles for training, the dogs physical structure and motivation for weaving, and handlers ability to train each. Weave pole training consists of angulated weave pole entries, 360-degree independent entries on two poles with distance, 4 pole weaving with guide wires or operant shaping, 4 pole weaving of the right, left, recall and send, front cross and rear cross. All behaviors will be on 4 poles until dogs are fluent before going to 6 or 12 poles. Handling skills class will teach you (the handler) how to use your movement and position to tell the dog where to go on an obstacle line or ground path. This class can use a variety of obstacles while teaching the handler key positions as the dog performs independent obstacles or turning skills. Dogs will learn how to go forward, lateral, and turn away from of the handler. Instructor discretion for which obstacles are used. Jumping skills with include training on all jump obstacles, tire jump, panel jump, broad jump, triple jump, double jump, wall jump, and ascending jump. 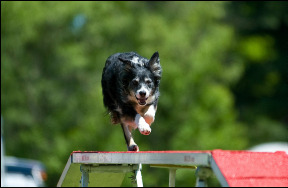 Dogs will learn to perform collection, extension, front, rear and blind crosses on each jump obstacle as well as perform sequential jumping on different jump combinations. This will include foot work exercises, bounce jumping, and specific jump handling cues like serpentines, threades, and back-sides. This class can be run at any level (novice, open, masters or international level) Students will work competition style courses relative to the level specified. This class is meant to practice running full courses without errors, testing skills on lead outs, course analysis, and execution. This class is not designed for obstacle training. This class will focus on teaching the handler how to asses the dogs line with in obstacle sequencing. All obstacles may be used in the class so dogs should be proficient on all obstacles. Handling may be limited if obstacle are not completely independent. This class is meant to help you make better handling choices when course analizing. This class can be taught at all level, novice, open and masters. This class will focus on understanding and improving the dog’s commitment point to increase distance skills. This class will include independent obstacle training, obstacle discrimination, layering and handling techniques. 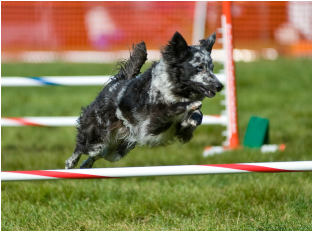 The Excellent level is for those Agility teams who are beyond the Open level and competing in any of the highest levels in Agility competition. This class will focus on those skills required to be successful at the highest levels in all Agility venues. Teams are expected to be competent on all obstacles, and have most skills independent. Students will be challenged with course strategy, distance skills, multiple changes in direction, efficient handling techniques, and increasing speed. This class will focus on all four handling positions to allow the handler to move in any direction as the dog performs the contact obstacle to criteria. Dogs should already have an understanding of what their contact behavior is. This is not a retraining contact class. This class focuses on the finished obstacle behavior. Students learn what their exact "cue" is (physical, verbal or both) for each obstacle. The goal is working towards achieving a consist behavior from the dog for each cued obstacle. Students will learn how to vary their positions while executing moving cues. This is a perfect class for intermediate level students, dogs who need more work on a specific obstacles or students who want to go back and make these specific skills stronger. This class is for those who have been working on a running contact but still don’t have reliable independence. This class will redefine the dog’s criteria and clarify the cues for driving forward vs turning off the board. This class is not for beginner dogs. This class will focus on identifying each dog’s skill level and setting up a training plan to advance the skills to an independent weaving behavior. This class is for those who still don’t have reliable weave pole behavior. This class will explain and clarify the dogs path on in all sequences. Handing skills will be taught individually and then utilized in sequencing to keep the dog on the natural and efficient path. Dogs should have good obstacle skills. This class will focus on execting of each cross. Coursework will include using crosses on all obstacles, collection and extention. This class will focus on the Jumping skills needed for each specific level. Classes will be instructed for the level specified on the schedule. Novice Jumpers will focus on extension, collection, different jump obstacles and handling cues. Open and master levels will take these skills and advanced them into more complicated coursework. This new class is for those teams looking to push themselves beyond a regular Agility class. There will be dog and handler fitness training, coordination drills, speed exercises and memory exercises. This class will take your skills above the the normal competitor. In order to sign up for this class you must have a great attitude, be willing to be involved in other students training and have an open mind. This class is designed to get you ready for Novice competition. This class will continue to work on sequencing multiple obstacles on both a jumpers and standard style course. Teams will continue to work on course analysis, adding new skills like obstacle discrimination, serpentine's, and other jump configuration skills. There will be more focus on start-lines, position cues, jumping extension, jumping collection, front and rear crosses on all obstacles. This class is open to any team who has taken Novice Prep or is competing at the Novice level. This class is will teach you about the competition aspect to Agility. Topics will include; agility venues, what level and program to start in, what classes are offered in a competition, what to bring to a trial, course maps, competition proofing, training in the ring and ring behaviors. This is the class for those students who are ready to take there skills into competition but maintain class criteria. Competition isn't easy but when you set yourself up for success its way more fun! Learn how to be a great competitor for your dog! This class is for the masters level team who wants to make sure their obstacle training is as independent as possible. The goal of this class is to challenge both the dog and handler out of their performace comfort zone while using positive reinforcements to maintain independent behaviors. The focus of this class is to move the student past novice course work and into executing more challenging skills in sequences. Some of the skills that will be worked on; Obstacle discriminations, extension / collection cues, specific handing cues for wraps, backsides, threadles, serpentines, blind crosses, turns and straight line sends. The Skills and Drills classes will take various agility challenges, break down the needed skills to perform them and perfect them in execution. Some skills that will be covered are independent obstacles performance, obstacle discrimination, distance work, jump configurations, serpentine's, pinwheels, lateral movement, lead out positions and straight line sends.